The Trance X frame remains unchanged since last year, when it received a number of key modifications to lighten and stiffen it. A zero-stack tapered head tube leads into a straight top tube and swooped, S-bend down tube with plenty of room for fitting a water bottle. If we’re being ultra picky we’d prefer just a few centimetres more standover clearance on the size large, and we’d like to be able to drop the seatpost further without having to cut it shorter due to the kinked seat tube design. It’s great that this entry-level bike includes a cable guide for a dropper-post remote (it is the same frame as the higher-specced bikes in the range) but not so great that there are no ISCG (international standard chain guide) tabs on the BB shell for fitting a chain device. The Tora fork from the 2011 bike remains largely unchanged (aside from a few incremental damping improvements), although it’s now renamed by SRAM the RockShox XC 32. It’s a good performer, smooth on small bumps and roots thanks to a sensitive coil spring, but ramping up nicely towards the end of the stroke rather than diving into a harsh knock as some cheaper coil forks can. With only 120mm of travel to manage, the damping feels very controlled. The 127mm of travel of the Maestro rear suspension matches up well with the feel of the fork and it’s hard to believe Giant’s in-house shock performs so well. Set-up proved as easy as adjusting the sag and twiddling the rebound. Job done. The Trance X is now trammelled with Schwalbe’s Nobby Nic tyres — we’d recommend you put them straight on eBay and get hold of something better. The wheels themselves were light and remained true. Unglamorous but thoroughly capable Shimano Alivio makes up the bulk of the drive, with a Deore rear derailleur glitzing it up. Shifting was easy, smooth and precise in use. A press-fit BB makes it nigh-on impossible to fit a chain tensioner. The brakes have been swapped from last year’s Shimano to Avid Elixir 1. We prefer the lever shape and control and we haven’t been plagued by the bleed issues which normally afflict Avid brakes. The seatpost is way too long and the kink in the seat tube means you can’t drop it low enough — just take a hacksaw to it, but remember to leave enough post to support the frame. The Trance X4 carries with it a huge weight of expectation, so we aimed to counter that bias by actively trying to dislike it, picking fault with everything that moved. There are a few little niggles that disappoint: that seatpost issue, and we couldn’t stop the cables rubbing on the rear shock. But it’s impossible not to like the bike itself. It’s a fantastic ride that encourages you to flick the back end round tight turns, manual through every compression and pop the bike off every sizable lump in the trail. The light frame and wheels mean it climbs and accelerates with gusto — we even rode a mass-start enduro race on this most capable of machines. Again, if we’re being picky, size-specific chainstays could improve performance further — especially on the larger sizes — without the bike losing any of its playful character. Aside from a few tweaks and a fresh colour scheme Giant has made no changes to the Trance X4 since it won our bike of the year award last year. That’s a dangerous game to play in an innovation-led industry, but in the case of the Trance X4 there was nothing much to improve on an already near-perfect bike. It is the best-performing suspension bike you can buy for £1,200, but we’d go further than that and say it beats bikes costing twice its price. It is, quite simply, a steal and now even better value than last year after its price drop. This test first appeared in the August 2012 issue of MBR. Want bigger wheels? 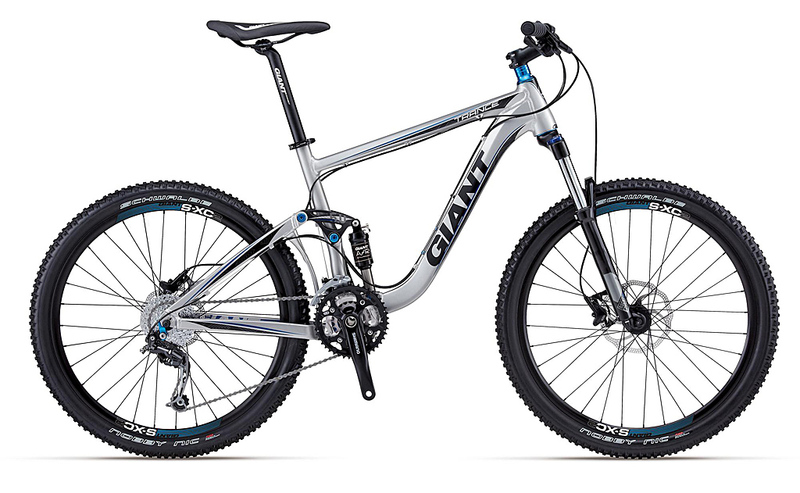 Here’s our review of the Giant Trance X 29er.